This week my beautiful wife and I volunteered for a few hours at Atlanta's Community Food Bank. If aren't familiar with food banks, these non-profit agencies rescue food that would otherwise be "wasted out" by restaurants or grocery stores for one reason or another and then redistribute this food to their locally food impoverished citizens. Sadly due to the current financial times, these citizens now come from all walks of life. We did something together and got to meet a bunch of people (other volunteers) we probably would never normally meet. Why Volunteer in the First Place? Last week I was in a VERY dark place, fluctuating between feeling sorry for myself and being pissed at myself and the world for the current financial crunch my family is currently experiencing. As the man of the house, this burden rests particularly heavy on my shoulders and the thought of not being able to meet the needs of my children (something which hasn't happened yet) is currently my Number One nightmare. "Take the focus off you." Knowing exactly what that meant I hopped on the ol' trusty computer and registered to volunteer not only at ACFB but Habitat For Humanity. Here on this blog I pontificate at length about getting back to me and encourage all of you to do the same who may not be the same man or woman you once were now that you're a mom, dad, wife or husband. Working out as I've mentioned often is great. But there has to be more. As a child I was indoctrinated into service through my church's Sunday School. This experience continued through middle and high school years. In college I pledged a fraternity that has as one of it's primary tenets being in the service of others. As a young corporate America guy I participated in a few community service projects, most memorably at State Farm Insurance where I participated in a build with Habitat For Humanity. Then I got into the non-profit world and began hosting volunteer events myself. This is when and where my volunteerism ended. Why volunteer when I'm coordinating everything, right? 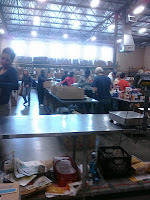 This week my soul opened up at the food bank. I felt a long lost piece of me return home. At 4pm when the session was officially over, they had to tell me to stop. I know I had a good two more hours of hard labor left in me. While we were there my wife received a call for a 2nd interview for directorship she really wants. We walked away smiling and looking forward to working with the staffers again. That night I went to be happy, slept well and woke up refreshed. And these are just some of the joys that come from serving others. This experience impacted me so strongly that I am now committed to putting in 27 hours of Community Service before the end of this year, MINIMUM. Why 27? Because 27 is a nice odd number that actually forces you to keep a tally and it also happens to be the number of my date of birth. 27 hours can be 27 weeks spent mentoring a child 1 hour at a time. 27 hours can be 3 build days at Habitat For Humanity. 27 hours can take whatever form you wish as it pertains to serving others, whether that is hands-on, doing volunteer admin work in an office, teaching a workshop, gardening a community plot, etc. In the coming weeks as I look to take this blog to places it's never been before expect to see an initiative around 27 Hours of Volunteerism And Service. The inspiration just hit me, so stay tuned while the seed takes root to bear fruit. 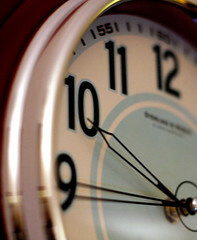 Have you volunteered at all in 2011? What and where have you volunteered? Do you think you can commit to volunteering 27 hours of your time this year in the service of others? To learn more about the effects of Hunger in this country visit, Feeding America.